ALBANY, NY – The American Heart Association’s “The Cardiac Kids” began the Congenital Heart Defect Awareness Week during the Albany Devils game Saturday against the Hartford Wolf Pack. 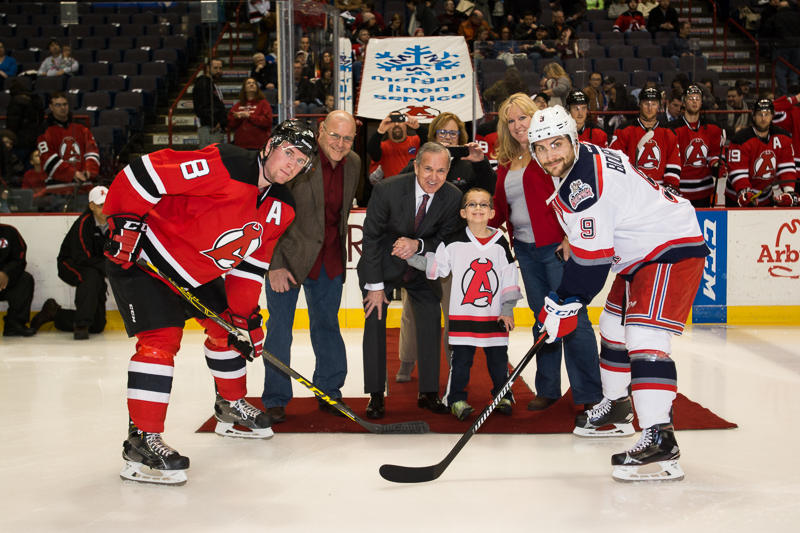 To help kick off the event six-year-old Patrick, who had his first heart surgery at two weeks old and his fourth when he was four, dropped the ceremonial puck drop before the game. 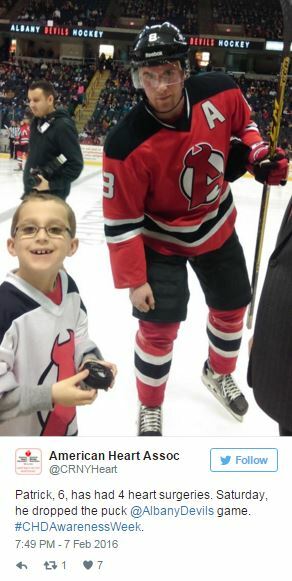 Devils’ alternate captain Dan Kelly and Wolf Pack forward Chris Bourque joined Patrick on the Times Union Center ice. Needless to say, Patrick stole the show. “The Cardiac Kids” consists of children born with congenital heart defects and their families. One in 100 children are born with a congenital heart defect — the most common birth defect. Feb. 7 – 13 is Congenital Heart Defect Awareness Week. The Devils and the American Heart Association were proud to honor the youngest survivors, and celebrate the scientific advances that allow them to live long and healthy lives.